Wnt signaling pathways, once thought to act strictly in development, are now known to play important roles in adult tissues, including in nociceptors where they can mediate pain sensitization. New work from Rohini Kuner and colleagues at the University of Heidelburg, Germany, reveals that Wnt3a triggers two distinct intracellular signaling pathways in primary afferent nociceptors to produce mechanical or thermal pain sensitization. The findings may have translational value, as the researchers showed that blocking Wnt signaling reduced pain in a mouse model of bone cancer. The study was published July 2 in Neuron. The finding of two distinct pathways underlying the different symptoms is clinically important, said Xue-Jun Song at Parker University in Dallas, Texas, US, who also was not involved in the current work. And the idea that a ubiquitous, non-pain-associated molecule such as Wnt initiates pain sensitization—that represents a new way of thinking for pain scientists, Song added. Wnts are a family of small, secreted signaling proteins that act at Frizzled (Fzd) receptors, to set in motion one or more signaling cascades with a wide range of outcomes. Previous research established Wnt signaling as important during establishment of neuropathic pain in rodents. A 2013 study from Song and colleagues found Wnt3a-mediated signaling in neurons of the spinal cord. And Tang and colleagues previously found evidence of dysregulated Wnt signaling in the spinal cord of HIV patients with neuropathic pain (see PRF related news story). To look in more detail at Wnt signaling networks in nociceptors, Kuner and first author Manuela Simonetti assessed Wnt and related proteins in mouse dorsal root ganglia (DRG) neurons using quantitative RT-PCR and RNA sequencing. Sensory neurons expressed many proteins associated with Wnt signaling in both the so-called canonical and non-canonical pathways—notably the Wnt receptor Fzd3. Noticeably absent from the DRG neurons was Wnt3a itself, Kuner said, but Wnts are known to be produced in diseased tissue in patients with cancer and other pathological conditions. “That’s why we focused on Wnts,” Kuner said. “It’s an interesting scenario: the ligand is in the periphery and its receptors are highly expressed in sensory neurons—I love this idea of a tumor-nerve interaction,” she added. In the current paper, Kuner showed evidence for peripheral production of Wnt in mouse models of bone cancer and of inflammation, where Wnt3a was detected in the paw but not the DRG. To find out whether Wnt signaling at Fzd3 receptors on sensory neurons could lead to pain sensitization, the researchers injected Wnt3a into the paws of mice. Seven hours after injection, the mice displayed no spontaneous pain, but showed sensitization to both mechanical and thermal pain. Using electrophysiological recordings in a skin-nerve preparation, the investigators saw that a subset of nerve fibers developed abnormal activity in response to application of Wnt3a in the skin. The researchers next wanted to determine which of many possible intracellular pathways were activated downstream of Wnt3a signaling at Fzd3. Using a combination of transgenic mice, pharmacological manipulations and RNA silencing, the researchers thoroughly dissected the various pathways. They found that acute pain sensitization did not involve the so-called canonical pathway, where Wnts control gene transcription through modulation of β-catenin levels. Instead, thermal hyperalgesia was mediated through a non-canoncial pathway involving activation of phospholipase C, Src kinase and calmodulin-dependent kinase. That pathway led to increased membrane levels of the transient receptor potential vanilloid 1 channel (TRPV1), the key arbiter of heat sensation and thermal hyperalgesia. In contrast, mechanical hyperalgesia was generated through another non-canonical pathway acting through the RhoGTPase Rac1 and its target c-Jun amino (N)-terminal kinase (JNK). This pathway was active in nonpeptidergic nociceptors and in myelinated mechanoreceptors, consistent with these cells’ role in mechanical hypersensitivity. Wnt3a treatment of cells increased membrane translocation of TRPA1 and the ATP receptor P2X3, two channels thought to contribute to painful mechanical sensitivity. 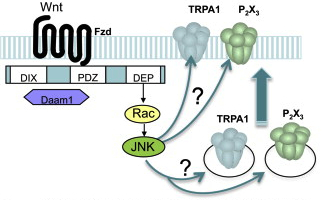 Blocking peripheral TRPA1 or P2X3 prevented Wnt3a-induced mechanical sensitivity. Mice with bone cancer develop mechanical pain sensitivity at the tumor site, but mice treated with antibodies or other reagents to block Wnt3a or Fzd activity showed attenuated pain sensitivity, indicating that the findings may translate to physiological disease conditions. Image: Adapted from Simonetti et al., 2014. Wnt-Fzd Signaling Sensitizes Peripheral Sensory Neurons via Distinct Noncanonical Pathways. Neuron. 2014 Jul 2; 83(1):104-21. Wnt Signaling in the Pathogenesis of Human HIV-Associated Pain Syndromes. WNT signaling underlies the pathogenesis of neuropathic pain in rodents.